We welcome your suggestions and encourage you to email us with your feedback. Today, Latin America remains a key foreign-investment target with a host of local economies once again on the rebound. Brazil, one of the world’s leading economic lights with GDP approaching US$2 trillion according to the World Bank, tops the region and is followed by Mexico (US$1 trillion GDP) along with thriving nations that include Argentina, Colombia, Chile, Peru and Ecuador. Despite this, Latin America’s equity markets remain relatively undercapitalized. Mexico’s economy ranks 15th worldwide with GDP exceeding that of Switzerland and the Netherlands yet trails both countries in market capitalization (currently at US$455 billion); similarly, Brazil’s GDP outflanks Canada and South Korea, yet it too is dwarfed in size by those markets. Historians suggest that the political instability and currency crises of the late ‘90s and beyond have helped slow development in Latin America. However, one need only look to Asia—where countries like Korea and Taiwan have built a thriving securities finance market without compromising risk-management practices—for proof that such challenges can be overcome. Liquidity is the lifeblood of any stock exchange, of course, and securities finance has historically been key to boosting investor confidence. The good news is that securities borrowing and lending (SBL) programs, as well as related strategies, continue to make progress in Latin America, with key players taking steps to harmonize lending platforms for the benefit of investors and brokers alike. Brazil has been focused on implementing best practices around securities finance, and is poised to launch its first-ever fixed income market for lending. With the help of the RMA and other industry groups, Mexico has bolstered its global presence in an effort to promote foreign participation, while Peru’s revamped lending processes offer participants improved operational transparency. And in Argentina, officials are optimistic that an initial securities lending CCP launched in 2017 will ultimately evolve into a more globally accepted platform. 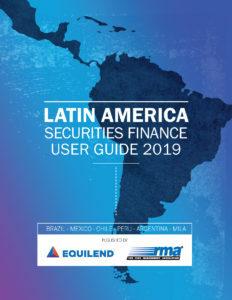 EquiLend and RMA would like to offer our sincerest appreciation to all the Latin American securities finance market experts who have contributed to this user guide. The information contained in this guide was compiled from publicly available information as well as contributions from domestic and international market participants, exchanges and independent consultants. We look forward to our continued work with the Latin American securities finance markets and updating this guide yearly as advancements are made across the region.